I’m continuing with my video reviews of books I’ve reviewed on the blog before. Next is The Hitchhiker’s Guide to the Galaxy! You can watch the video below. If you’ve read this book, what did you think? Let me know in the comments below. Back on Earth with nothing more to show for his long, strange trip through time and space than a ratty towel and a plastic shopping bag, Arthur Dent is ready to believe that the past eight years were all just a figment of his stressed-out imagination. But a gift-wrapped fishbowl with a cryptic inscription, the mysterious disappearance of Earth’s dolphins, and the discovery of his battered copy of The Hitchhiker’s Guide to the Galaxy all conspire to give Arthur the sneaking suspicion that something otherworldly is indeed going on. . . .
God only knows what it all means. And fortunately, He left behind a Final Message of explanation. But since it’s light-years away from Earth, on a star surrounded by souvenir booths, finding out what it is will mean hitching a ride to the far reaches of space aboard a UFO with a giant robot. But what else is new? So Long, and Thanks for All the Fish is the fourth book in The Hitchhiker’s Guide to the Galaxy series by Douglas Adams. Although it is the last book in the omnibus I read, it is not the final book in the series. This part takes a different path than the others and remains mostly in just one place, Earth. But wasn’t Earth destroyed? I was initially surprised by this book. I wasn’t expecting them to be back on Earth. There’s a very heavy focus on Arthur Dent’s life with the occasional Ford Prefect appearance, more often toward the end. But we’re introduced to a new character, Fenny (or Fenchurch) who becomes an interest for Arthur. You see, she may be somewhat like a female Arthur, in my opinion. She’s very quirky, but a very interesting character. We get to see Arthur in a very different light here, as he knows so much more than everyone else about what’s happened, and he’s able to work on solving a problem. He’s actually quite resourceful. Ford is out in space still, but he seems to be as eccentric as ever. For a while, I thought he was going crazy. He was acting so bizarrely. Trillian and Beeblebrox don’t appear, though they are mentioned. Marvin makes a small appearance. I was a bit disappointed by the lack of Trillian and Beeblebrox. The story is so different than the previous three parts, as they remain on Earth for most of the story. It’s a much more coherent story than before, but remained funny. While the story wasn’t all over the place, Arthur’s actions still resulted in unpredictable consequences, and Ford’s disturbing behaviour was plain weird. And the dolphins. What’s going on with the dolphins? There were a few things that were left unexplained at the end, so I expect them to be explained in the final part. Earth itself is the same, yet different than what Arthur left. The people are the same, although Fenchurch is obviously different. Arthur has knowledge that it was destroyed, and even has evidence of his trip through time and space. It happened, but the time elapsed in his life and on Earth are different. Mysteries abound, and I’d like to find out what’s going on. Overall, I’d give this a solid 4 out of 5 stars. It’s not as wacky as before, but it’s still very fun. Highly recommended to anyone who enjoyed the previous parts. This series should be read in order to be able to understand what’s going on. Discworld’s pesky alchemists are up to their old tricks again. This time, they’ve discovered how to get gold from silver — the silver screen that is. Hearing the siren call of Holy Wood is one Victor Tugelbend, a would-be wizard turned extra. He can’t sing, he can’t dance, but he can handle a sword (sort of), and now he wants to be a star. So does Theda Withel, an ambitious ingenue from a little town (where else?) you’ve probably never heard of. But the click click of moving pictures isn’t just stirring up dreams inside Discworld. Holy Wood’s magic is drifting out into the boundaries of the universes, where raw realities, the could-have-beens, the might-bes, the never-weres, the wild ideas are beginning to ferment into a really stinky brew. It’s up to Victor and Gaspode the Wonder Dog (a star if ever one was born!) to rein in the chaos and bring order back to a starstruck Discworld. And they’re definitely not ready for their close-up! 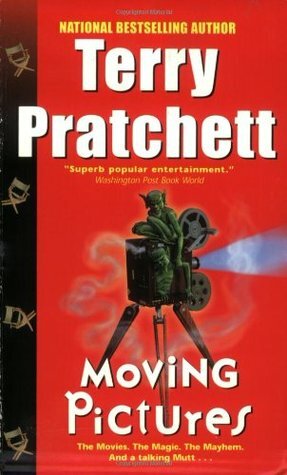 Moving Pictures by Terry Pratchett is a very obvious parody of the Hollywood movie industry, particularly the early years. This is the tenth Discworld book in the series, and the tenth I’ve read. The characters are a very interesting bunch this time. It centres around Victor Tugelbend, a wizard in training at Unseen University who also happens to be an expert slacker. He becomes the unlikely hero of the story, and is a pretty likeable character. As a mashup of several Hollywood actors, in my mind, he looks mostly like Clark Gable. Then there’s Theda Withel, or Ginger as she’s best known in the book, a small town girl who becomes a movie star. She starts out stuck up and unlikeable, but I warmed to her as the story went on. She’s a kind of mix of several Hollywood actresses, though there’s quite a bit of Marilyn Monroe going on. Gaspode is also a major character, but he’s a dog that can talk. He provides a lot of the humour. Other major players are Cut-Me-Own-Throat Dibbler, who is a greasy businessman who seems to be able to sell anything. Not a very nice character, but he’s well-known in Ankh-Morpork. Thomas Silverfish is the President of the Alchemists Guild, who ends up becoming the first movie executive. He’s pretty aggressive at first, but he’s a bit of a pushover. There’s also a lot of other characters, including the Librarian, several wizards from Unseen University, trolls, and more. It is a pretty funny group, though. The story presents a big mystery that Victor must try to solve. Although this is a fantasy satire, it has a bit of mystery He has to find the secret of Holy Wood. Throughout the book, there are a lot of gags, especially involving stereotyped movie characters and Hollywood people, but I think the most impressive and funniest has to do with the Librarian toward the end. It spoofs a very well-known movie very well and turns it on its head. I thought that was very funny. As with all of Terry Pratchett’s Discworld novels, many things are parodied. The most obvious are silent movies, guy-gets-the-girl-in-the-end movies, miraculous last minute heroics, Lassie, and even one of Marilyn Monroe’s most iconic photos. See if you can spot all of these and more. The setting is an interesting one. Holy Wood is where most of the story takes place, though also sometimes in Ankh-Morpork and Klatch. But Holy Wood is the star. The whole town is kind of like a Hollywood set, everything showy on the front, but look behind the facades and you see rickety wood supports. It reminded me of the wild west, but Hollywood style. It’s cheap, hastily built, and not very impressive-looking. But there was a buzz about it, and although of crappy quality, it was exciting. Moving Pictures was a fun book. Not Terry Pratchett’s best, but it was very enjoyable. It’s definitely recommended to Discworld fans. I gave it 4 out of 5 stars. 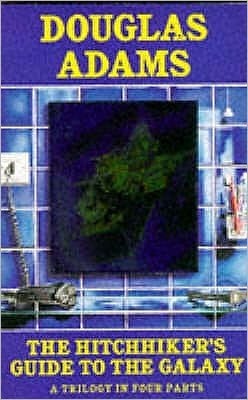 Life, the Universe and Everything is the third novel in the Hitchhiker’s Guide to the Galaxy series by Douglas Adams. It’s a continuation of the previous book, but it’s also a self-contained story. I read this in the Trilogy in Four Parts omnibus. We start off with Arthur Dent alone in his cave trying to consider whether he should go mad or not when Ford Prefect shows up after quite a long time. We follow this pair for a while until they meet Slartibartfast and they go on an adventure to stop the people of Krikkit from destroying all life. The story mainly follows this trio, though they do manage to meet up with Zaphod, Trillian, and Marvin eventually. It’s a short story, but it does have quite a variety. Much of it felt very random with little direction. But it all had a purpose, and in the end, it all seemed to match up. Not that the story is over, not by a long shot. There’s still another part after this. The characters are the same as before, though with a focus on Arthur and Ford, we get to see their dynamics quite a bit. The return of Slartibartfast was refreshing, though I didn’t quite feel he seemed like a wise old man. Zaphod was his usual self, though much less prominent in this part of the series. Trillian was quite brilliant, I thought. Always level-headed, except that she was almost seduced by a god. Marvin had only a couple brief appearances, but his leg was a very important part of the story. Arthur and Ford carried this whole story, basically, though Trillian was a major contributor at the end. They continued to be quite amusing. The story took place in several places, though mostly going from planet to planet in Slartibartfast’s ship, the Bistromath. They did have stops on Earth, Krikkit, and a couple planets that are quite difficult to pronounce. Adams has quite the way of describing scenes, focusing on some absurd elements, as well as creating new words that he sometimes doesn’t even define. But don’t worry, you don’t need to know what they mean. You know, at first, I wasn’t really sure where this story was going. It was incredibly random, or so it seemed. Remarkably, I didn’t feel very enthusiastic about reading it, but as it progressed, I realised that everything was connected. Some of it was quite brilliant, I thought. I just kept getting better, and the ridiculous situations made me wonder what was going to happen next. It was certainly entertaining. Overall, this was a solid entry in the series, and I recommend it to anyone who has read the first two parts. It’s a quick read. I give it 4 out of 5 stars. Eric is Terry Pratchett’s 9th Discworld book, and it’s a pretty short one. It also features the return of the popular character Rincewind. I like Rincewind, but does he make this book good? As with Pratchett’s other Discworld novels, this is a parody of several themes, including Faust (the title of this book is alternately Faust Eric), Dante’s Inferno, and Homer’s Iliad. It involves Rincewind (and his Luggage) getting pulled out of the Dungeon Dimensions by a young demonologist, Eric. Eric, thinking Rincewind is a demon, commands him to do three things for him. It’s through these commands that we’re treated to the humourous journey that Eric and Rincewind take through various places and times. That’s all I can really say without spoiling the story. The main characters are, of course, Rincewind and Eric. Rincewind is his usual inept self, unable to conjure up a spell, and just plain making a mess of things. Eric is a teenager who thinks of himself as a demonologist, although he isn’t very good, either. He is also quite naive, doesn’t listen well, and doesn’t seem to learn well, either. Death makes an appearance at the beginning, but that’s all. Then there’s the demon king Astfgl who seems to love paperwork and bureaucracy. Doesn’t seem very much like Hell, does it? There’s a lot of other more minor characters that show up, as well. I like Rincewind, of course. He’s probably my favourite character of Discworld at the moment. Eric, I didn’t really care about. If he lived or died, it didn’t matter to me. Usually, a Discworld book is a winner with me. However, this is probably the first time I have to say that is not so. While it was mildly humourous, it featured Rincewind, and the situations were ridiculous, the story felt quite muddled and unfocused. It jumped around a lot, and I just couldn’t get into it like Pratchett’s other books. Sure, I liked it. I enjoyed it. But it wasn’t that funny. I’d still recommend it to fans of Pratchett. But I wouldn’t use it to introduce Discworld to anyone. It is a very quick read, though. It won’t take much time at all. Overall, I’d give it 3 out of 5 stars. Book Review – Guards! Guards! 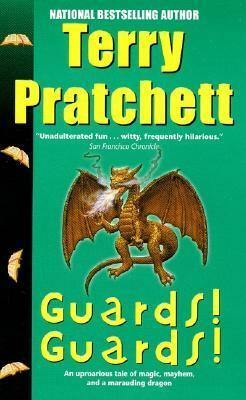 Terry Pratchett’s Guards! Guards! is the eighth book in the Discworld series. Pratchett is a master at satirical humour in a fantasy setting, and his books are always great light reading. Guards! Guards! is one of the better ones. This book centres around the Night Watch of the City Watch in the city of Ankh-Morpork, the greatest city on the disc. Carrot is a new recruit from the dwarf mines, while his colleagues are Captain Vimes, Sergeant Colon, and Corporal Nobbs. Carrot is a young, eager man, ready to please anyone. He is quite naive, but has great knowledge of the law. Captain Vimes is the often drunk leader of the group. Sergeant Colon doesn’t like to see much action, and is usually in the office. Nobby is one strange guy who seems to never play things by the book. All four of these main characters are delightfully developed, and they go through quite a bit during the course of this book. Vimes develops into a wonderful character, and has some hilarious drunken thoughts. Carrot shows amazing initiative in a law enforcement group that basically has no power. The Librarian, an orangutan at the Unseen University, joins the group. He is one of my favourite Discworld characters. Nice to see him here. Lady Ramkin is another colourful character who breeds swamp dragons. She is quite funny, and a great addition. Lord Vetinari also plays a part in this book. And you can’t forget the dragon. The ensemble cast was very entertaining. 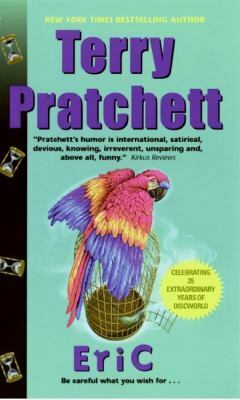 The story was Pratchett’s usual witty plot, poking fun at various subjects, such as police novels and “hero defeats the dragon and turns out to be the last king’s heir” kind of story. Unexpected incidents is what I expect with Discworld novels, and this one did a very good job at that. I expected Keystone Cops kind of buffoonery, but got an actual good story, albeit a silly one. But it worked remarkably well. I find that Pratchett has a good comic sense most of the time, though sometimes it isn’t as funny as I’d hoped. However, Guards! Guards! was very funny. There was more than one occasion when I laughed (thankfully, no one looked at me on the train when I did that). Most of Pratchett’s books involve more than one setting location, but Guards! Guards! took place about 99% of the time in Ankh-Morpork. I got to know the city better through this book, and sometimes revisited locations I’d seen in previous novels. It’s a very interesting city in many ways, but I wouldn’t want to live there. It’s a city that works with Guilds for thieves and assassins, who legally do their illegal work. The city has a lot of unusual characters, shady neighbourhoods, and a dangerous, yet popular bar. I think you should visit Ankh-Morpork through Guards! Guards! and take a tour with the Night Watch. It’ll be worth your time. So far, this may be the best Discworld novel I’ve read. Highly recommended! So, I will give this a full 5 stars.